Want to get a stupendously clean shave every time without having to worry about replacing pricey cartridges every single week? You may want to consider giving up that popular 5-blade shaver in favor of a safety razor then. If you’re just getting into wet-shaving and are looking for a decent razor that is well-made, highly effective, and wallet-friendly, we suggest taking a look at the Parker 99R Long Handle Butterfly-Open Safety Razor. It’s a great shaver that will last forever and give you a smooth shave every day. The parker company is known for making high quality razors so you can trust the razor will perform. Below, we provide a full review of this tool to help you make a decision on it. Yes, they seem a bit old-fashioned, but they are a hidden gem that get the job done better than a Gillette or Schick, plus, in the long-run, they’re much more affordable. You have to shell out a little money initially to get a decent razor, but, honestly, a good razor is just a one-off fee that costs just a little more than a package of cartridges for your current getup. Plus, the blade on a safety razor is much more effective at trimming your beard, no matter how coarse it is. When you do have to replace the blade it will NEVER cost you $20 to $30. In fact, a package of blades for a safety razor can be as cheap as $11 for a hundred. Featuring an incredibly durable brass frame that has a gorgeous chrome-plated finish, a super easy to use butterfly-open design, a long, textured handle for unmatched grip, and a good amount of weight for effortless strokes, the Parker 99R is easily one of the best razors on the market today. Parker is a company that’s been at the forefront of the shaving industry for more than 40 years. They’ve consistently built and manufactured high-quality safety razors that exceed customer expectations throughout their entire existence. 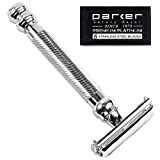 In other words, you can rest assured knowing that when you purchase a model like the Parker 99R Safety Razor, you’re getting a ton of value for the money. Ready to Grab It? CLICK HERE to Order the Parker 99R from Amazon Right Now! It’s not often that you’ll come across a razor that is both functional and aesthetically pleasing. The Parker 99R effectively rolls outstanding performance and elegance into one awesome little package, though. It’s made from high quality metals that won’t rust in the shower or break when you drop the razor on the ground. The razor is built incredibly strong and will last a lifetime as long as you take proper care of it. Plus, it looks fantastic sitting on the counter next to the sink. The chrome-plated finish screams class as it shines in the light. It’s a truly stunning piece of equipment that anyone would be delighted to own. Most safety razors have a rather bothersome three piece construction that requires you to basically completely disassemble the razor to swap out blades. This gets pretty old fairly quickly. The Parker 99R operates a bit differently, however. It has what is referred to as a butterfly-open design. This razor style allows you to quickly and easily change out your razor blades by simply twisting the head. Upon twisting it, the head splits open and makes it incredibly simple to pull the old blade out, put a new one in, and twist back to secure it in place. This is a great feature that relieves a lot of headaches associated with most safety razors. Ready for the Best Shave of Your Life? CLICK HERE to Get the Parker 99R for the BEST Price! Perhaps one of the best features of this razor, though, is the handle and its weight. Having a long handle on a razor like this is important, especially if you’re just transitioning from a cartridge shaver. The longer handle makes it easier to hold and maneuver. If you’ve got larger hands or long fingers this will be a blessing for you, too. A lot of razors have short handles which feel awkward to hold. On top of that the unit is a heavyweight style. This just means it has a little extra weight behind it. This particular model weighs approximately 3.4 ounces. It’s just enough to make every pass incredibly easy. In other words, you won’t have to strain to apply unnecessary pressure against the razor to ensure a good clean shave. The Parker 99R Long Handle Butterfly-Open Safety Razor is one of the most popular and highly-rated safety razors available today. Many claim that Parker razors, including the 99R, are unrivaled in quality and performance. They say that it gives an excellent shave every time, has superb balance, feels great in your hands, and has the perfect amount of weight for making each stroke as smooth and effective as possible.